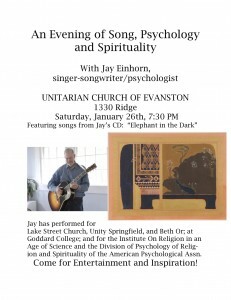 I’ll be performing at the Unitarian Church of Evanston, 1330 Ridge, on Saturday, January 26th, at 7:30; $10.00 at the door. 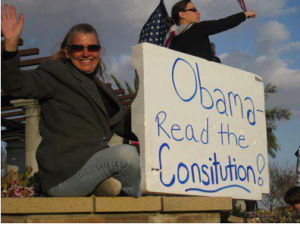 A Facebook buddy shared this photo of anti-Obama rally participants showing a sign: “Obama, Read the Consitution.” Of course, they think it means what they think it does, even if they can’t spell it. The Constitution has been interpreted in various ways ever since it was written. During the Civil War, both sides fought to defend the Constitution. The doctrine of “original intent,” meaning that the Constitution should be interpreted in light of how the framers would have understood the issue at hand, is in vogue. I am told that the majority in the U.S. Supreme Court favors the doctrine of “original intent,” including the Justice who would likely have been a slave had he been alive when the Constitution was written.